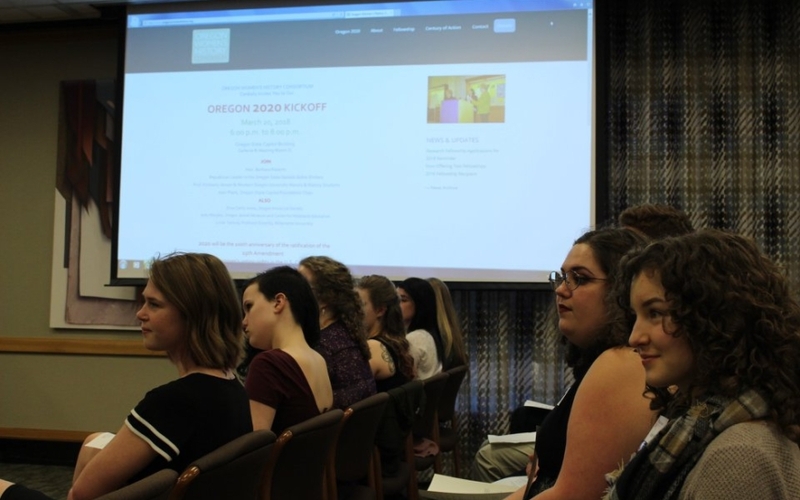 Western Oregon University students explored additional information about the week of Oregon’s ratification of the Nineteenth Amendment from newspapers around the state. They share their comments on selected newspapers articles below. 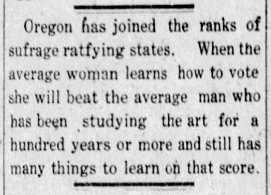 “Oregon Legislature Ratifies Suffrage,” Pendleton East Oregonian, January 12, 1920. 1. “Houses at War for the Adoption of Own Resolutions,” East Oregonian, January 12, 1920, 1. On Monday January 12, 1920, Pendleton’s East Oregonian published its evening newspaper with the banner headline “Oregon Legislature Ratifies Suffrage.” Both the House and the Senate passed a Joint Resolution on the Nineteenth Amendment. Interestingly, the actual article that discusses the ratification in less than twenty lines in length. (“Houses at War for the Adoption of Own Resolutions,” East Oregonian, January 12, 1920, 1.) In an exciting header, the article begins with an emphatic retelling of the moment the vote happened in the senate chamber. The senators were so anxious about the vote that some of them called out “aye” before the clerk called their names. 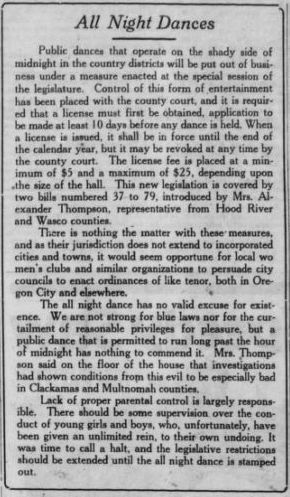 “All Night Dances,” Oregon City Enterprise January 23,1920, 1. “‘Bad Men’ Have Character”, Klamath Falls Evening Herald, January 14, 1920, 3. On January 14, 1920, on the day of the vote to have Oregon ratify the Nineteenth Amendment, the editors of Evening Herald of Klamath Falls decided to publish the article “‘Bad Men’ Have Character.” This article, dripping with misogyny, toxic masculinity, and female degradation, told why every woman wants “to find her master in spite of the vote and other things.” (“‘Bad Men’ Have Character”, Klamath Falls Evening Herald, January 14, 1920, 3.) This opinion piece explained why “good women” fall for “bad men” referencing several broad fallacies, stereotypical generalizations, and offensive rhetoric. “Siletz,” Lincoln County Leader, January 16, 1920, 1. The Lincoln County Leader was a weekly newspaper based out of Toledo, Oregon and the paper reported on events and news from all over Lincoln County. The front page was divided into sections where each town would have their portion to report news. Aside from the society pages, which explained who came to visit, who went out of town, and who had tea with whom, there was not much mentioned about women in the Lincoln County Leader of 1920. Occasionally there would be advertisements, such as one for Chamberlain’s Tablets, promising to permanently cure “periodic attacks of headache.” There was no mention of Oregon’s ratification of the Nineteenth Amendment. There may be several reasons for this. 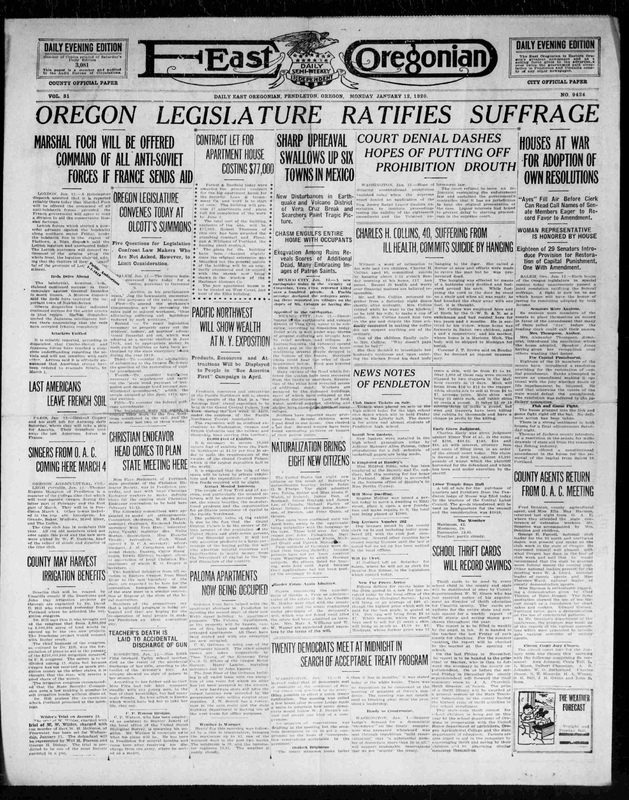 Perhaps the authors of the newspaper did not care about woman suffrage, or maybe they did not think it was important enough to mention considering Oregon women had the right to vote since 1912. “Extra Session of the Legislature: Ratification of National Woman’s Suffrage First Act of Solons,” Newberg Graphic, January 13, 1920, 1. On January 13, 1920, the Newberg Graphic published “Extra Session of the Legislature: Ratification of National Woman’s Suffrage First Act of Solons” (Newberg Graphic, January 13, 1920, 1.) 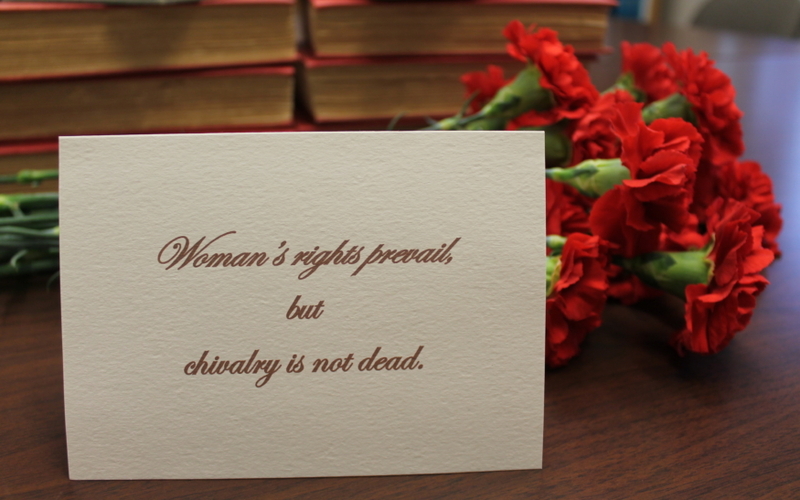 Governor Olcott called the special legislative session, and the ratification of the Nineteenth Amendment was one of the first actions of the legislature. 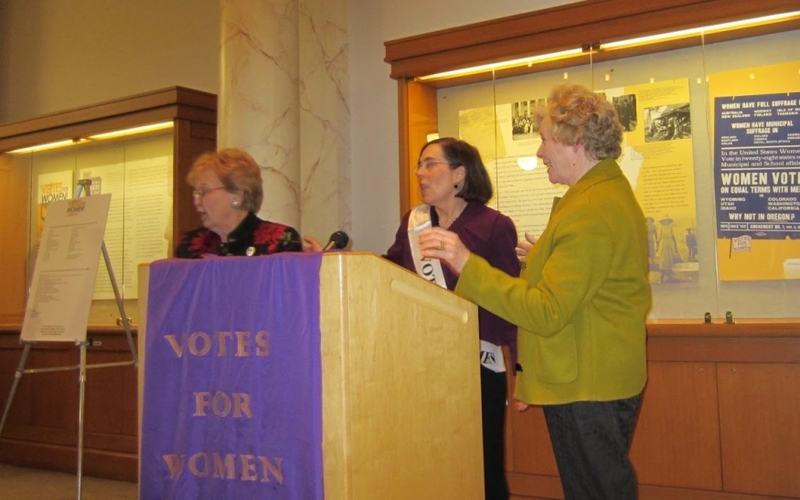 The Newberg Graphic referenced the “Final Action for Suffrage” photograph in the Portland Telegram without knowing that the picture had been staged. 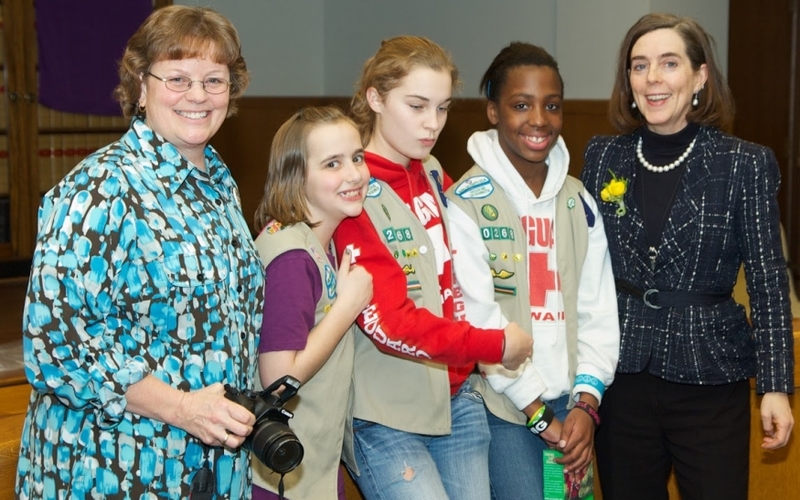 Excitement for this new amendment and the special session began to arise quickly throughout the State of Oregon. Many of the hotels in City of Salem had been “well filled with guests.” But there had not been many lobbyists present at the time. 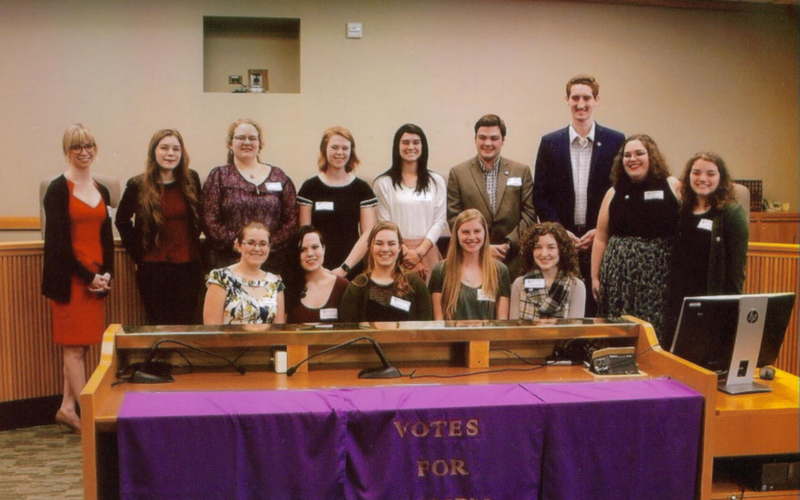 Despite the massive support from the likes of Salem and other cities across Oregon, there hadn’t been many lobbyists (members of the Third House). “Woman Suffrage Timeline,” St. Helens Mist, January 23, 1920, 7. Click here for additional timeline. “Wheelwright is Heard Here” Hood River Glacier, January 8, 1920, 1. The editors of the Hood River Glacier published “Wheelwright is Heard Here” (Hood River Glacier, January 8, 1920, 1.) This article starts off by saying current members of the Anti-Asiatic Association (AAA) were preparing to introduce a bill to be voted on during the next general election. The bill would prohibit first generation Japanese immigrants from owning land. W. D. Wheelwright, a businessmen from Portland who had dealt with Japanese and Japanese American business leaders over several years, countered the AAA at the Riverside Forum. 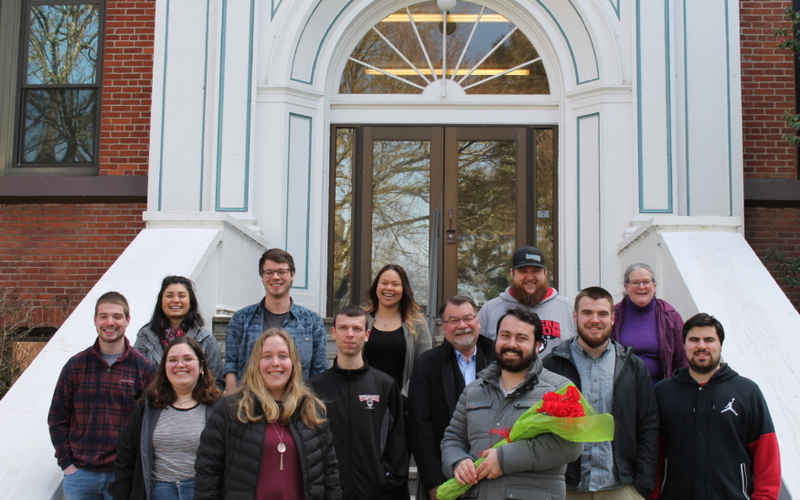 After the meeting, AAA members declared Wheelwright’s opposition to their bill would only invigorate their activity in support of their measure. R. E. Scott, a member of AAA, noted that many people were sending him letters in support of their action and wanting to know more about their plans. Wheelwright appealed against the AAA’s bill due to possible tensions being created between the United States and Japan, which would be detrimental to their business relations. Despite his preaching about Japanese business, Wheelwright stated his strongest appeals were not related to it. The strongest appeal, he stated, would be for both America and Japan to exploit China so all three nations could benefit from the interaction. Wheelwright then made a call to action. Americans should match the Japanese in every regard and would have nothing to fear from the Japanese. “Special Session Meets Monday,” Springfield Review, January 8, 1920, 1. “A Model Institution,” St. Johns Review, January 16, 1920, 4. The St. Johns Review published an article on Friday, January 16, 1920 on the Portland Woolen Mills and mill general manager and secretary E.L. Thompson. The article highlighted the benefits of working at the mill, specifically how the working conditions were superlative especially for female workers. 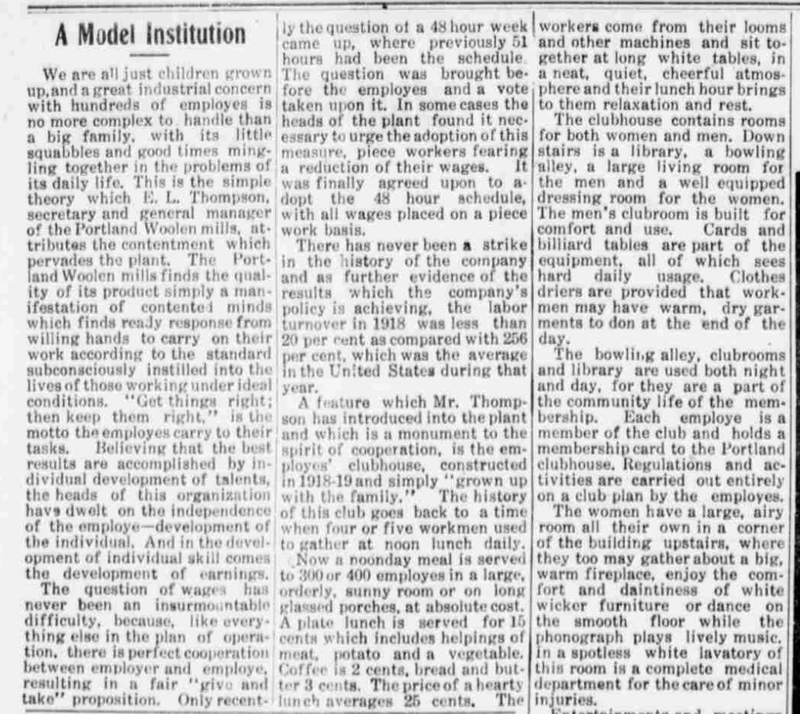 The editors noted the plant supported a “give and take” proposition focusing on “perfect cooperation between employer and employee.” (“A Model Institution,” St. Johns Review, January 16, 1920, 4.) The editors’ word choice and examples of positives indicate an obvious support for Portland Woolen Mills and E.L. Thompson. The cooperation described is bookended by the editors’ indication that there has never been a strike in the history of the company and that the labor turnover was less than a tenth of the national average in 1918. 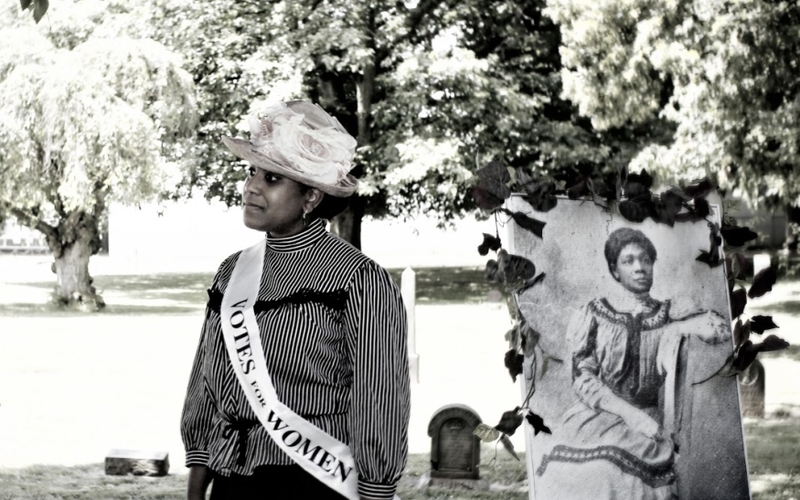 A significant statement considering the burgeoning awareness concerning women’s labor rights, including the founding of the U.S. Department of Labor Women’s Bureau that same year. The article painted a picture of contented and happy workers who have no reason to question the company’s authority. Monmouth Oregon is a rural town located halfway between Corvallis and Salem. It is home to one of Oregon’s oldest public universities, Western Oregon University. 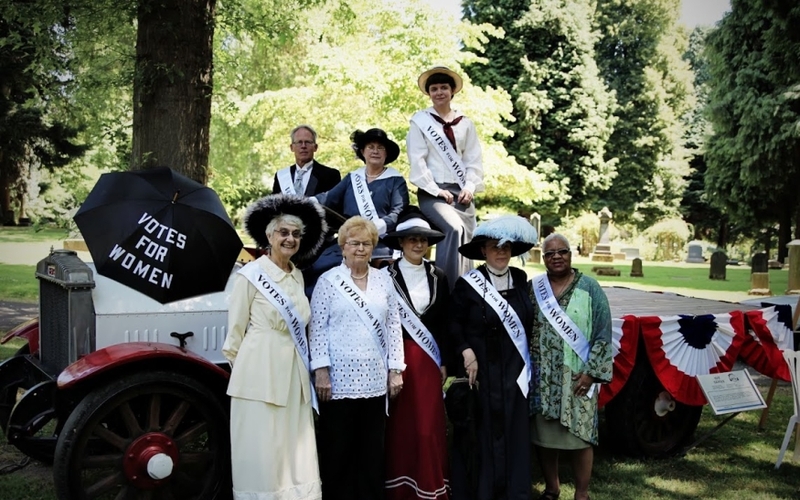 This rural community has been through its fair share of historical events, but one question kept pushing its way to the top: What did Monmouth, Oregon have to say about the ratification of the Nineteenth Amendment? “J. Thomas, “Leap Year,” Monmouth Herald, January 16, 1920, 1. The Monmouth Herald of 1920 is what you might expect from a newspaper catering to a town primarily of farmers. It includes an abundance of advertisements and updates about the neighbors that call the Monmouth area home. One item of interest is an editorial cartoon titled “Leap Year,” which was also being used as a cartoon in other newspapers at this time. (“J. Thomas, “Leap Year,” Monmouth Herald, January 16, 1920, 1.) The history of Leap Year was an excuse to reverse gender roles allowing women power that wasn’t normally associated with them. The phenomenon occurs when February has twenty-nine days and was observed well into the 20th century within the United States. 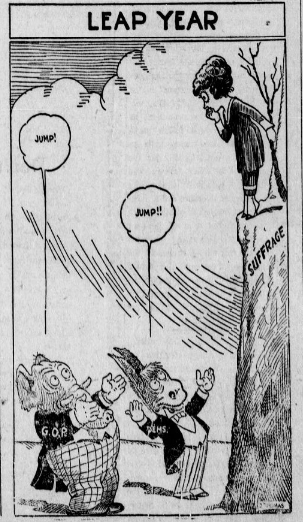 The title of the cartoon is playing off of this “societal norm” portraying the fact that this is the year that women have the power, and the ratification of the Nineteenth Amendment is on their agenda. The cartoon was created J. Thomas and was a nationally-syndicated appearing in many newspapers. After the ratification it seems to reference women voters’ choice between voting as Republicans or Democrats and the parties, represented by the animals, hoping that they choose them. Even though it was created for a more general audience, the cartoon could symbolize Representative Sylvia Thompson, as she was the creator and signer of Oregon’s ratification resolution. The illustration could also represent her decision of staying a Democrat or becoming a Republican to receive credit for her resolution. 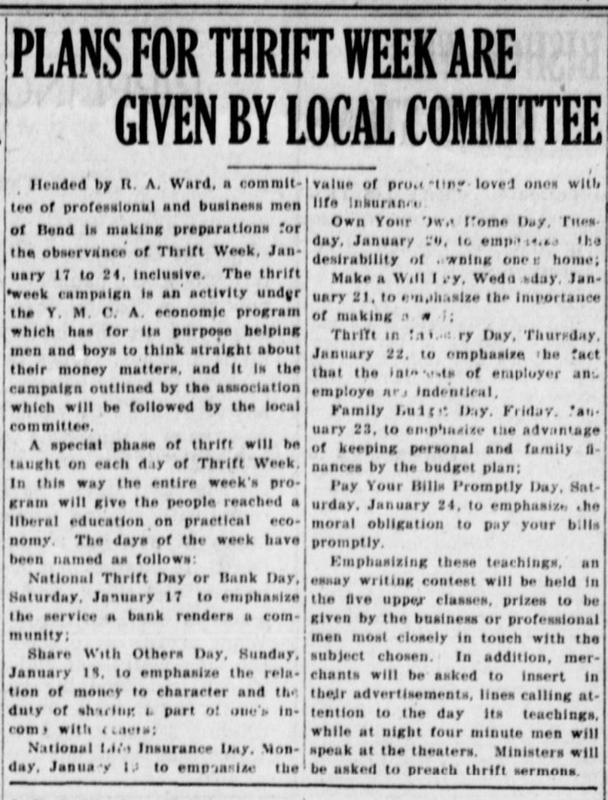 Plans for Thrift Week Are Given by Local Committee,” Bend Weekly Bulletin, January 15, 1920, 3. Saturday, January 17, was “National Thrift Day or Bank Day” which was to help men understand how and what a bank can offer a community. Sunday, January 18 was “Share with Others Day” which was meant to help the men in the community understand the “relationship of money to character.” They wanted to ensure everyone understood their part in their local economy. Monday, January 19 was “National Insurance Day” to emphasize the “value of protecting loved ones with life insurance.” Tuesday, January 20 was “Own Your Own Home Day” to emphasize the value and ownership of owning property. Wednesday, January 21 was “Make a Will Day” to emphasize the importance of making a will for loved ones. 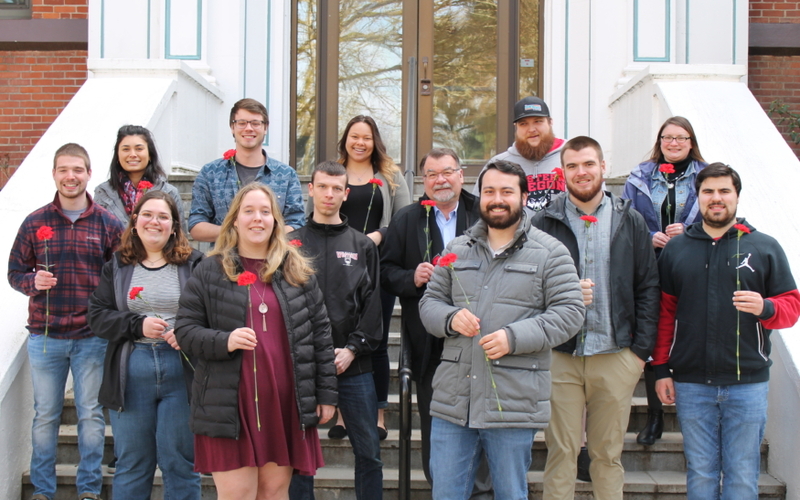 Thursday, January 22 was “Thrift in Labor Day” which emphasized that interest should be equal among employers and employees. Friday, January 23, was “Family Budget Day,” which emphasized “the advantages of keeping personal and family finances by the budget plan.” The last day, Saturday, January 24 was “Pay Your Bills Promptly Day” to emphasize the importance on paying one’s bills on time. Throughout the week organizers held writing contests with prizes given to men “most closely in touch with the subject chosen.” Ministers were also asked to preach thrift sermons.